Straight out of Redmond, USA comes a brand new smartwatch concept, once created by Archil Vardidze. 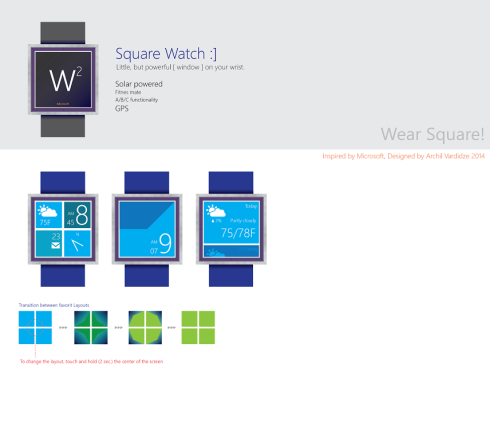 He imagined a Microsoft watch that he dubs Microsoft W2 or Square Watch. The core of the idea is to use the Windows Phone interface with some tweaks. The design mimics the look of a window, following the company’s trend of creating a window into the world of technology for the everyday user. This Microsoft smartwatch is solar powered, making it independent from the wall charger. The solar panels are placed around the screen and the case is made of aluminum, to keep the weight light. This model features an altimeter, barometer and compass since it’s supposed to behave great outdoor. GPS is also in the mix, as well as Bluetooth 4.0 low power for pairing with smartphones. That’s all the designer had to say about his concept smartwatch and now let’s have a say about it. I think this is the type of model you’d see selling well in India, for $99 or even $49, or perhaps bundled with a Surface Pro 3. It’s basically your one stop for tile notifications and similar functionality. Cortana should also be included, as well as other features that can be borrowed from Windows Phone.